Is it too early to look Google Earth’s timeline gifthorse in the mouth? It’s an excellent new tool — so much so that I’m wishing I could do more with it. 1. Add periodicity: Some datasets have a natural periodicity to them — seasonal water temperatures, for example, or the tides, or the daily schedule of ferries in Stockholm. It would be very useful to be able to compare successive equivalent phases in the data. As it is now, events that happen in successive days, months or years will also appear in the timeline successively. 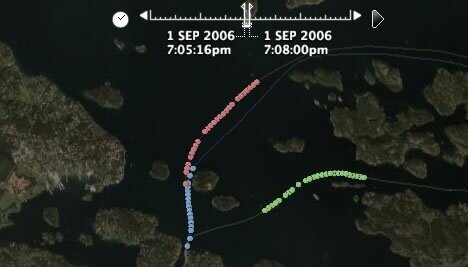 For example, here are the time-enabled trajectories of the 6pm ferry from Stockholm to Sandhamn on August 30, 31, and September 1. Each trajectory leaves separately; but how would these trajectories look relative to one another, timewise? It would be cool to build in such functionality into the timeline tool — an option that lets you choose the periodicity of the data (hour, day, month, year, and perhaps week? ), and then an option that lets you choose whether you want to show the data for each phase simultaneously or in succession. For example, for the ferries it makes sense to show the data simultaneously, but for overlays showing global snow cover, it would make sense to show December data for successive years in succession, so that long-term trends become visible. 2. Fine-tuning controls: There is currently no way (that I know of) to advance from individual time event to individual time event in a granular way. This makes it harder to navigate precisely, or to ensure that something is always visible, especially if the timeline is set to show just an instant rather than a wedge of time. But Virgil had to “cheat” as well. As he explains, he chose to associate the stills with overlapping time spans rather than just the instant they were taken, so that there is no danger of the user seeing nothing at all. And the ScreenOverlay hack is a good way of forcing images to be visible, in the absence of a (documented) way to control the popup balloons. How would such granular controls work? Well, I’d be happy with a simple keyboard shortcut, but otherwise two extra arrows in the UI would suffice, just as with current multimedia players. 3. A way of controlling timeline settings from within the KML. Virgil’s problem would also be solved if he had the ability to control the timeline’s settings via KML. How the data is presented can make a big difference to what information is highlighted. There should be a better way than telling users what the precise settings should be — as Declan Butler does in his recent post on the revamped avian flu layer. If a layer is best viewed with the the time wedge clamped to the left-hand side, then it would make sense to have the KML impart this preference. 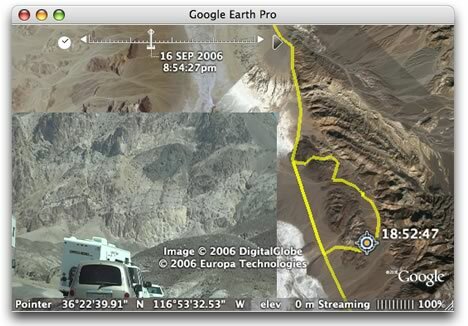 A related topic is that the timeline stretches to incorporate all time-enabled KML files that are currently visible on Google Earth, even if they are far apart temporally, or of a radically different timespan. This means that one or more datasets will become difficult to navigate. In sum, the timeline is a wonderful innovation, one for which the possibilities are just beginning to be explored. also, the COM API is not accessable from KML but I agree, they are making some good changes to the underlying infrastructure. Stefan, I like your suggestions. I agree with all of them. I would also add that a way to control the span of time covered by the time gadget be controlled by which folder is selected in the Places pane. Right now if you have two time stamped folders, with two widely differing time spans, the time gadget shows the time span for both – which makes it ineffective for playback for one or the other. Currently, the beginning and end of a time line are barely shown. For example, if you are viewing a time line from 2 pm to 6 pm, and the width of the shown interval is 1 hour, the animation starts at 2-3 pm, and loops to 5-6 pm, showing all points in time from 3 to 5 pm for a third of the time, but 2 pm and 6 pm only for an instant. It would be better if it started at 1-2 pm (so initially showing only that single point in time), and looped to 6-7 pm. That way, all points in time would be shown for an equal period (20% of the time). This would help tremendously for stuff like this rain radar mockup. I have been looking at google earth and would like to make a comment on a gross error. At posittion 34.33’08” S 58. 41’44”, which is near where I live (Buenos Aires, Argentina) there is a gross picture overlapping. The pictures taken on that area overlap over an area of more than 300 feet. I believe this is an error that should be avoided. It causes confusion (as to the exact location and distances of some positions) and leads to consider google earth as a deficient tool. I hope this picture overlapping is taken into account, so as to make a better version of it. Furthermore, I would like to comment on the fact that many of the pictures of less populated areas are still too poor in detail. 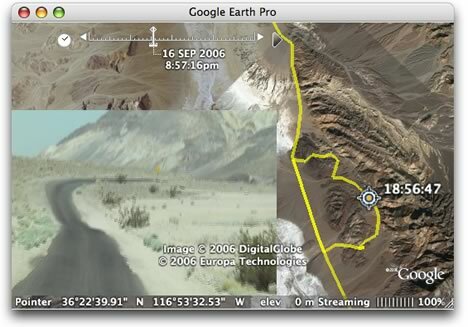 I hope that, with time, google earth incorporates better images of all of the earth.